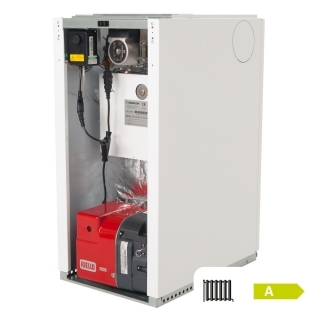 The Warmflow Utility Pumped Boilers (UPHE) are supplied with a pre-wired, factory-fitted burner, thermostat and circulating pump. Only one IE320 mains socket (supplied) needs to be wired on site. They are also factory-fitted with a 3-Bar pressure relief valve and auto air vent as standard. The multi-optional flue system can be routed through the top, back, left or right hand side of the casing. The Warmflow Utility Pumped Boilers allow for hassle free, quick and cost-effective installations.